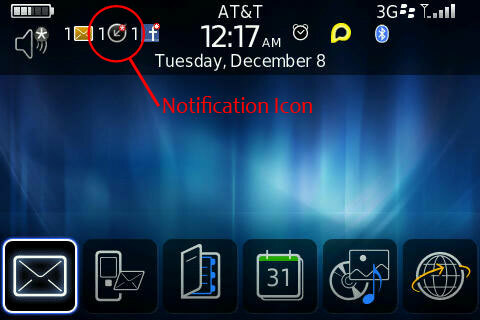 I hadn't really seen this until last night when I noticed a new notification icon I had never really seen before. It showed that I had 1 notification for something. Since most notifications end up in the message inbox, I checked in there first to see what it was. It seemed that the new icon was a notification letting me know that there was a new update for an app I had installed. 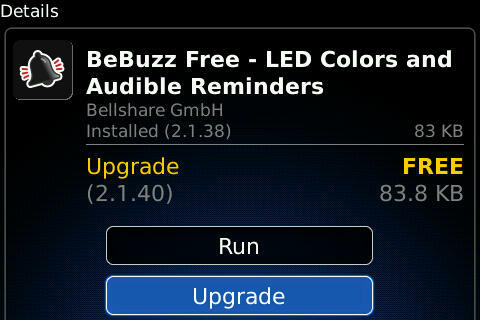 That app being BeBuzz Free. 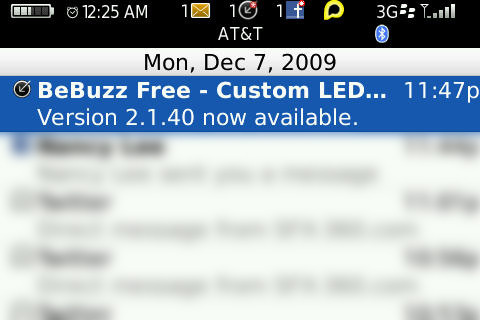 This was an app I had downloaded some time ago from the BlackBerry AppWorld app. When clicking the message, it takes you directly into BlackBerry AppWorld and to the app upgrade page itself. Now this is something that is very useful I think. I know that the iPhone has a similar thing in place where it lets you know that there are app updates on your homescreen right on the App Store icon. Now it seems that Rimm has done the same thing with their AppWorld app. This is a welcome addition to the app and gives me extra incentive to download apps through AppWorld instead of through OTA links which I usually do outside of AppWorld. Thank you so much for posting this…I have had this icon for two days and had no clue what the heck it was…you helped me not go crazy figuring it out! Would be nice to be able to just click on those random icons up top, so it could tell us, yes? No problem. Glad to be of some help.